Parents managing and handling children and young adults at home can be a challenge. What about dealing with over 600 and doing it as your profession? Tom Bambrey has been relating to students since he graduated from Wabash College in 1968. First, he taught at the high school and college level. Then, he elevated to dean of students, and had to concern himself with not only academic achievement of a student, but the life of each one. He has done that at his alma mater for eight years. "The two things important in this position are relating to students and enthusiasm for the job," Bambrey said. "Those things continue to be true to me." Bambrey made the life-changing stop as a student at Wabash in 1964. A high school track star at a small high school near Pittsburg, Pa., he was recruited by legendary Wabash coach J. Owen Huntsman. "Wabash changed my life. There’s something about this experience at Wabash that changes people’s lives. You learn to love learning." After graduating four years later, it was back to western Pennsylvania. Bambrey taught and coached at Southmoreland High School until 1971. There was enough of a shortage of teachers in the state during the era that deferments from the military draft were given to some. Despite his love for teaching, he desired more from the education process, both for himself and his profession. He attended the University of Denver on a graduate fellowship. "I had wanted to go West for a long time," Bambrey said. By 1977, he earned his masters degree and Ph.D. from the school. Before he finished his Ph.D. work, he was hired by the university as a professor. The dean of students job was a natural match for him. He and his wife, Rosalie, had both their children while living there. Their daughter, Tara, is now married and living in Eugene, Ore. Son, Jamie, still lives outside of Denver. "They grew up Colorado kids so their lives are in the West," Bambrey said. The next challenge for Bambrey was in 1993, returning to the northeast as Dean of Students at St. Lawrence University in upstate New York. "I was in the middle of my career and thinking what I wanted to do next. I thought I wanted to come back to liberal arts education." Relating to the students is something Bambrey takes pride in, bridging any generation gap. "How you do that, mentor them through the processes and talk to them about their daily lives is a very important part of what we do." In 1997, he received a call. "I was at my desk one morning and got a call from (Wabash President) Andy Ford, saying the dean of students position was open and would I be interested in applying." The rest, as they say, is history. "I love the college. I was delighted to come back and see the college in a different way than a student would see it." Nestled between their children and Rosalie’s parents in Iowa to the west and his family in Pennsylvania, Crawfordsville is the fit for the Bambreys. Rosalie also is in the education field as administrator for the Ivy Tech Crawfordsville campus. Bambrey continues to excel at Wabash. He teaches a literature course in the fall to mostly sophomores and juniors. "Particularly on a small campus where you wear a lot of hats and do a lot of things, that’s ideal," Bambrey said. "The combination of being an administrator most of the time and the center of the process, faculty-student relationship, and being able to participate in that is valuable." Instead of putting the students in the lower component of education, Bambrey likes how Wabash exalts them. "The challenges are always learning and understanding each generation of new students," Bambrey said. "One of the things here that we’re totally committed to is making the students part of the process of everything that goes on here and give students opportunities to take leadership roles." The challenges are not gone, either personally or professionally. Bambrey took up golf several years ago and plays as weather allows. He has a regular workout routine, spends as much free time as possible reading and enjoys gardening with Rosalie. Work comes down many times to two sides of the job, including pointing out to the students ways to improve. "Even if I’m in the process of disciplining them, I have to care about them. You never know when you come to work on any given day exactly what you’ll find. 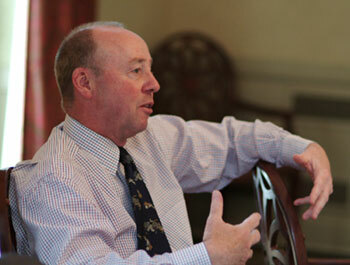 Deans of students, fundamentally, I think, are in the business of working with students in all ways that can come up." Rob Lee is a reporter for The Paper of Montgomery County. This story appeared in The Paper Jan. 12.